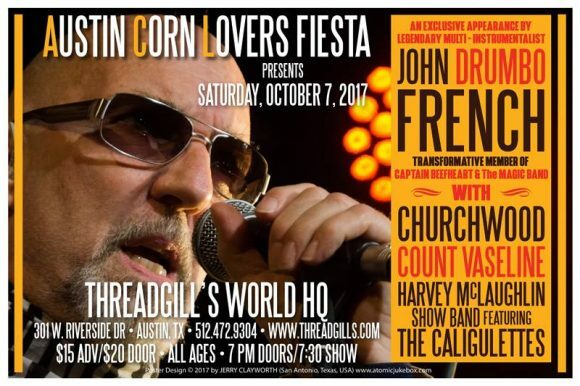 John French will be playing a show at Threadgill’s in Austin, TX, October 7th, 2017 as part of the Austin Corn Lovers Fiesta. A four-piece band, 3 backup singers, and 4 horns! Whoa! Twelve people on stage during parts of this show. This will be sort of a “celebration” of Beefheart music. A one-hour show at the former location of Armadillo World Headquarters — where I played with Don in 1971 and also where “Bongo Fury” was recorded. It will be a pretty different experience for me. Oh, and one of the singers, Aileen Adler also will be playing Theramin on “Electricity” and “Autumn’s Child.” I’ve never performed the latter tune, so it should be fun. Three acts will precede me on this coming event. I will start out with an MB-sized group. After a time, four horns will be added, then, after a few more piece, 3 singers. At the end, there will be twelve of us on stage. I’ve been white-knuckling the planning of this for months. I will be posting several songs from the gig on youtube. Excellent, look forward to hearing them. This is most intriguing, way more so than a MB gig.